Read updated news about key players in Vienna's international community, such as expats, executives, politicians, diplomats, investors, artists and others. 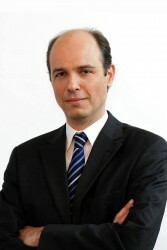 Ambassador Dr. Olexander Scherba has been Ambassador of Ukraine in Austria since November 2014. 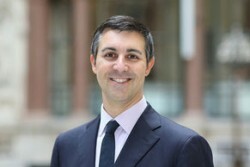 He has been a career diplomat since 1995 with oversees posts in Germany and the US. Besides Ukrainian and Russian, he speaks German and English. In the case of the controversial Ukraine correspondent of the ORF, Christian Wehrschütz, the Ukrainian ambassador in Vienna, H.E. Dr. Olexander Scherba, on behalf of the Ministry of Foreign Affairs of Ukraine, announced in a written statement that the accreditation in the war zone of Ukraine was "unlikely". The reason is still the "illegal" crossing (documentary filming) of the Crimean bridge which was illegally built by the Russian side. The two East Asian states, South Korea and Japan, which have been enemies for more than 100 years, are visited by Chancellor Kurz as part of the trip to East Asia. The trip is focusing on the economy, digitisation, education and transport. Meetings with South Korean President Moon Jae-in and Prime Minister Lee Nak-yeon are held in Seoul and with Japanese Prime Minister Shinzo Abe in Tokyo. 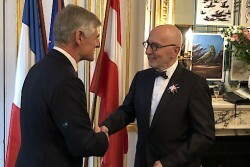 Dr. Richard Straub, who resides in Paris for more than two decades, received the Grand Decoration of Honour for Services to the Republic of Austria (Große Ehrenzeichen für Verdienste um die Republik Österreich) at the Austrian Embassy in Paris. 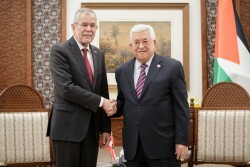 Federal President Alexander Van der Bellen met Palestinian President Mahmoud Abbas in Ramallah: "We are friends of Israel AND of the Palestinians. We want to deepen relations with both sides". Mahmoud Abbas thanked Austria for the "historical relationships" cultivated since Bruno Kreisky. Israel State Visit: "Austria is jointly responsible for the Shoah"
During his state visit to Israel, Austrian Federal President Alexander Van der Bellen emphasised Austria's co-responsibility for the Shoah. In the Holocaust memorial Jad Vaschem Van der Bellen bowed before the Jewish victims of National Socialism. Meanwhile, as expected, there is no lifting of the boycott against Foreign Minister Karin Kneissl or members of the Freedom Party's cabinet. The EU's Economic Partnership Agreement with Japan entered into force on 1 February 2019. For Austria, Japan is by far the second most important market in Asia and the third most important overseas trading partner. About 1000 Austrian exporters are active in Japan, 80 companies have local branches. In 2017 the trade volume reached an all-time high of 3.5 billion euros. 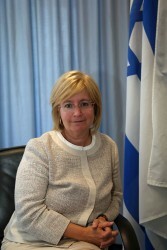 Ambassador Talya Lador-Fresher has been Ambassador of the State of Israel in Austria since 2015 and is Israel's permanent representative at the International Organizations in Vienna. She once told "The Diplomatic Club", that "It is hard to be a diplomat, it is harder to be an Israeli diplomat and even harder to be an Israeli woman diplomat." 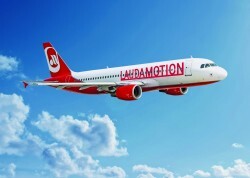 The Austrian Niki-Airline successor Laudamotion has now been taken over 100% by Ryanair. Ryanair last held three quarters of the shares of Laudamotion. No information was given about the price for the remaining 25 percent. 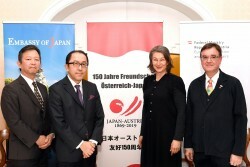 This year, Japan and Austria are commemorating the 150th anniversary of the establishment of diplomatic relations between the two countries. 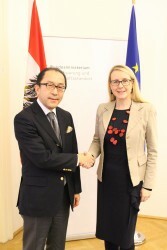 This week the kick-off event took place with the Japanese Ambassador in Vienna Kiyoshi Koinuma and the Head of the Section for Foreign Cultural Relations (Sektion V - Kulturelle Auslandsbeziehungen) at the Foreign Ministry, Section Head Ambassador Dr. Teresa Indjein. 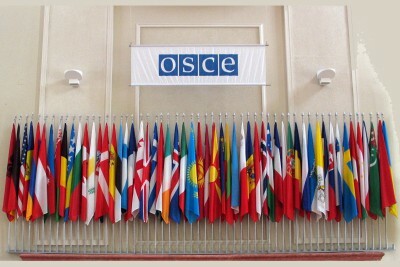 "As the home of the OSCE, Austria has always been a strong and generous supporter of our work and has allowed our Organization to conduct its important work," said OSCE PA President Tsereteli. Some top positions in the Austrian diplomatic service were awarded this week. The Council of Ministers of the Austrian Ministry of Foreign Affairs has decided to place new Austrian diplomats at head of following Austrian Embassies worldwide. 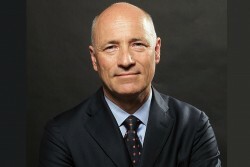 Ambassador Martin Weiss, the current Ambassador in Tel Aviv and former Speaker of the Austrian Foreign Ministry, will become the new Austrian Ambassador in Washington D.C., USA. 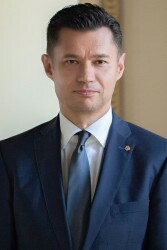 In the context of an extensive replacement of ambassadors in the Foreign Ministry, Dr. Alexander Marschik was entrusted with the direction of the Austrian Mission to the United Nations in New York City. As a diplomat with 4 years of professional experience in New York, it is a return to familiar parquet. 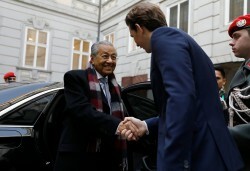 Mahathir Mohamad, who has been Prime Minister of Malaysia for the second time since 2018 at the age of 93, paid a working visit to Austria. In Vienna he met, among others, Federal President Alexander van der Bellen and 32-year-old Federal Chancellor Sebastian Kurz. Rosie MacLeod spoke to Michael Zimmermann, the new Austrian Ambassador to the United Kingdom, about the presidency and Austria's place within the European Union more generally. 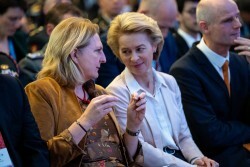 At a meeting of the defence ministers of Germany, Austria and Switzerland in Vienna, German Defence Minister Ursula von der Leyen once again called for a common European army and closer cooperation. 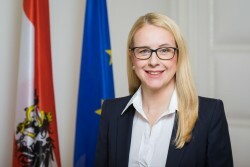 Following her appointment by the Austrian Council of Ministers in April last year, Dr.a Gabriela Sellner has now been accredited as Head of the Permanent Mission to the United Nations (Vienna), IAEA, UNIDO and CTBTO. 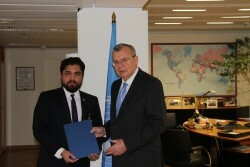 The new Permanent Representative of Nicaragua to the United Nations (Vienna), Carlos Morales Dávila, presented his credentials to the Director-General of the United Nations Office at Vienna (UNOV), Yury Fedotov. 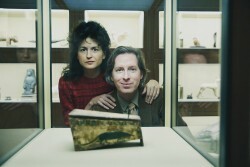 The American director Wes Anderson, known from films such as "The Grand Budapest Hotel" or most recently "Isle of Dogs", and his partner, the writer and costume designer Juman Malouf, were invited by the Vienna Museum of Fine Arts (KHM - Kunsthistorisches Museum Wien) to design an exhibition according to their taste. The result is an exhibition entitled "Spitzmaus Mummy in a Coffin and Other Treasures". The new Ambassador of the Republic of Iceland to Austria, H.E. Mr. Bendikt Ásgeirsson presented Austrian Federal President Alexander Van der Bellen with his letter of accreditation at the Vienna Hofburg. The new Ambassador of the Republic of Zambia to Austria, H.E. 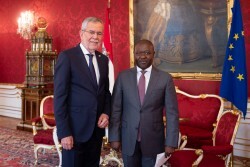 Mr. Anthony Mukwita presented Austrian Federal President Alexander Van der Bellen with his letter of accreditation at the Vienna Hofburg. 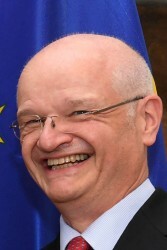 The new Ambassador of the Republic of Finland to Austria, H.E. Ms. Pirkko Mirjami Hämäläinen presented Austrian Federal President Alexander Van der Bellen with her letter of accreditation at the Vienna Hofburg. The new Ambassador of the Lao People's Democratic Republic to Austria, H.E. 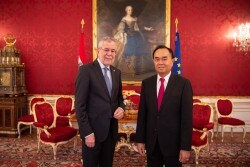 Mr. Sithong Chitnhothinh presented Austrian Federal President Alexander Van der Bellen with his letter of accreditation at the Vienna Hofburg. 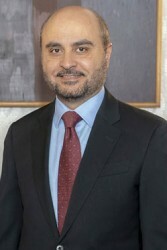 The new Ambassador of the Sultanate of Oman to Austria, H.E. Mr. Yousuf Ahmed Hamed Aljabri presented Austrian Federal President Alexander Van der Bellen with his letter of accreditation at the Vienna Hofburg. 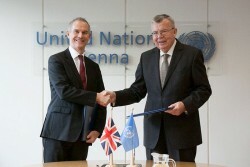 The United Kingdom and UNODC have signed two new funding agreements with a joint worth of EUR 10.13 million to strengthen UNODC's anti-corruption activities. 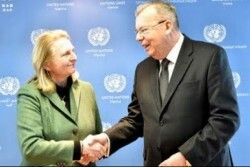 The report by the United Nations Office on Drugs and Crime (UNODC) was presented by UNODC Executive Director Yury Fedotov at a special event of the Commission on Crime Prevention and Criminal Justice (CCPCJ) with Austrian Foreign Minister Karin Kneissl. Drawing on information from 142 countries, the report examines trafficking trends and patterns, and puts the spotlight on human trafficking in armed conflict. The British FCO Foreign & Commonwealth Office has confirmed that Mr. Neil Bush will take over as the new Head of the UK Delegation to the OSCE in Vienna in March 2019. He succeeds Ms. Sian MacLeod OBE, who has held this position since August 2015. 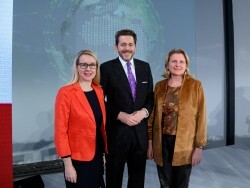 In a joint event in the Aula of Sciences, the Federal Government's new foreign trade strategy was presented by Economics Minister Margarete Schramböck, Foreign Minister Karin Kneissl and President of the Chamber of Commerce Harald Mahrer. The key points of the strategy are the following: Perspective, value orientation, location effect, focal points, future orientation, communication, efficient coordination. Egypt's President Abdel Fattah el-Sisi (Abd al-Fattah as-Sisi) also visited the Federal President, the Federal Chancellor and the Federal Parliament on the fringes of the EU-Africa Forum (High-Level Forum Africa-Europe), at which he received a EUR 350m commitment from the EIB to finance the expansion of the Cairo Metro. Every meeting emphasised that bilateral relations between Austria and Egypt were very good and that cooperation was to be extended. 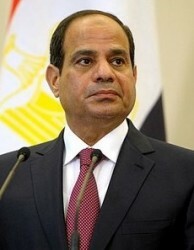 The former General, who is controversial because of his authoritarian style of government, had already made a clear rejection of the so-called "disembarkation platforms" in Egypt to the EU Council President Sebastian Kurz in Cairo during the summer. Leonard Bernstein - "I am enjoying Vienna enormously - as much as a Jew can"
An exhibition in the Jewish Museum Vienna to mark the 100th anniversary of the birth of the star conductor and composer Leonard Bernstein focuses on the New Yorker’s relationship with the music city of Vienna, looks at the great artist’s Jewish roots, and also pays homage to his political activities. 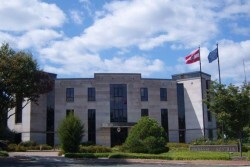 The new Ambassador of the Republic of Liberia to Austria, H.E. 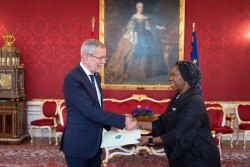 Ms. Youngor Sevelee Telewoda presented Austrian Federal President Alexander Van der Bellen with his letter of accreditation at the Vienna Hofburg. 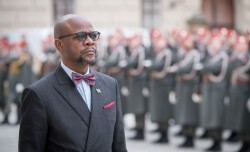 The new Ambassador of the Kingdom of Lesotho to Austria, H.E. Mr. Retselisitsoe Calvin Masenyetse presented Austrian Federal President Alexander Van der Bellen with his letter of accreditation at the Vienna Hofburg. 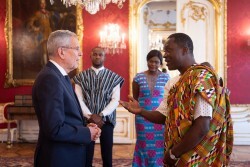 The new Ambassador of the Republic of Ghana to Austria, H.E. Mr. Ramses Joseph Cleland presented Austrian Federal President Alexander Van der Bellen with his letter of accreditation at the Vienna Hofburg. The new Ambassador of the Togolese Republic (Togo) to Austria, H.E. 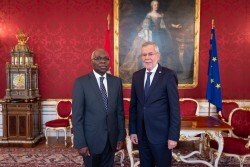 Mr. Komi Bayédzè Dagoh presented Austrian Federal President Alexander Van der Bellen with his letter of accreditation at the Vienna Hofburg. The new Ambassador of the Republic of Guatemala to Austria: H.E. 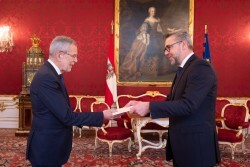 Mr. Manuel Estuardo Roldán Barillas presented Austrian Federal President Alexander Van der Bellen with his letter of accreditation at the Vienna Hofburg. 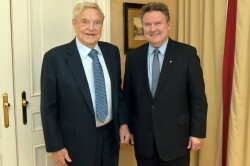 The new Ambassador of the Republic of Lithuania to Austria, H.E. Mr. Donatas Kušlys presented Austrian Federal President Alexander Van der Bellen with his letter of accreditation at the Vienna Hofburg. In Hungary, the Central European University (CEU) has faced massive hostility. 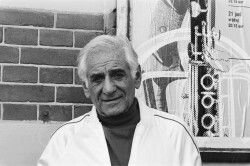 As a consequence, the location will be relocated to Vienna. Michael Ignatieff, the rector of CEU, announced this week in Budapest that the university is finally moving: "This is a dark day for freedom in Hungary, and it's a dark day for academic freedom." In Vienna, negotiations are still underway on a suitable building for interim use from 2019. By 2023, the university is to move permanently to the grounds of the Otto Wagner Hospital. 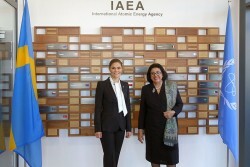 Her Royal Highness Victoria, Crown Princess of Sweden visited the laboratories of the International Atomic Energy Agency (IAEA) in Seibersdorf, Austria to understand how nuclear techniques help IAEA Member States with food and agriculture, human health, industrial applications and the environment. 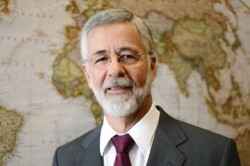 The new Ambassador of Brazil to Austria and to the International Organizations in Vienna, H.E. Mr. José Antônio Marcondes de Carvalho presented his credentials to the Director-General of the United Nations Office at Vienna (UNOV), Yury Fedotov and to the Director General of UNIDO, Li Yong. On 7 December 2018, he presented Federal President Dr. Alexander Van der Bellen at the Presidential Chancellery with his letter of credentials. H.E. 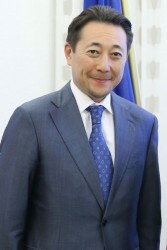 Mr. Kairat Sarybay is the Ambassador of the Republic of Kazakhstan to the Republic of Austria, Ambassador to the Republic of Slovenia and the Permanent Representative to the International Organizations in Vienna. The Prime Minister of Albania Edi Rama and the Vienna based OSCE have agreed on a new co-operation on anti-defamation package and rules for online media to ensure that future legislation is supportive of freedom of expression, media freedom and access to Internet. After opening an office in Frankfurt a year ago, another West European representative office is now to follow in Paris. 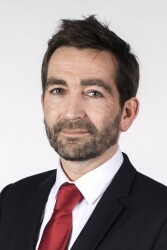 The new branch will be headed by Patrick Chevrel. As part of the Vienna Insurance Group, VIG Re has been founded in 2008 by being established as a core player in the reinsurance market in Austria and CEE, and now also in certain West European countries. How to Eliminate Violence against Women? In context with the UN-sponsored campaign "International Day for the elimination of violence against women", there are various initiatives against violence against women not only at the UN, but also in Brussels and Vienna. 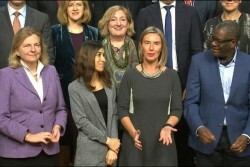 Federica Mogherini announced that the EU has decided to allocate an additional €5 million to support the projects of Nobel Peace Prize laureates, Nadia Murad and Dr Denis Mukwege. And the Austrian Foreign Ministry, together with the Austrian Integration Fund, is participating in the campaign "16 days against violence against women". Federal Chancellor Kurz held a working meeting with Swiss President Alain Berset in Bern. The meeting focused on, among other topics, an assessment of Brexit, the Western Balkans, the nuclear agreement with Iran, relations with Russia and the priorities of the Austrian EU Presidency. 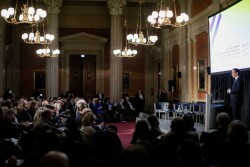 A high-ranking conference against antisemitism with the motto "Europe beyond Anti-Semitism and Anti-Zionism - Securing Jewish Life in Europe" took place in Vienna. 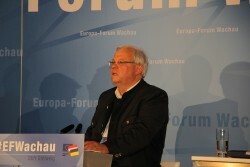 Participants included Ariel Muzicant, Vice-President of the European Jewish Congress (EJC), Education Minister Heinz Faßmann, EU Justice Commissioner Vera Jourova, EPP Group Leader Manfred Weber, Ukrainian Foreign Minister Pavlo Anatoliyovych Klimkin and Chancellor Kurz. Israeli Prime Minister Benjamin Netanyahu had had to cancel his participation at short notice because of the government crisis in his home country. Likewise not a single official representative of the Austrian Freedom Party was present. Saudi Arabian national Dr. Abdulhamid Alkhalifa has taken over the post of Director-General of the OFID (OPEC Fund for International Development) from his predecessor Suleiman J Al-Herbish at the former Palais Deutschmeister at Vienna's Parkring 8. His task is to implement OFID's objective, which is to reinforce financial cooperation between OPEC Member Countries and other developing countries, by providing financial support to the latter for their socioeconomic development. Karin Kneissl travelled to Vaduz for a working discussion with her counterpart from Liechtenstein, Aurelia Frick to discuss current developments such as the most recent status of the Brexit negotiations and the cooperation in multilateral matters. The Austrian government has passed the highly controversial Location Development Act in the Council of Ministers, which will speed up environmental impact assessments, be passed by the National Council this year and come into force on 1 January 2019. The new legislation will introduce automatic permits for certain energy infrastructure projects (eg, electricity grids and power plants). Positive reactions are coming from industry and politics. Various environmental associations criticise the new law. 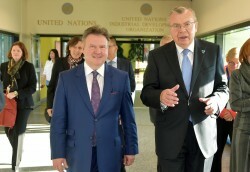 On the occasion of the 30th anniversary of the Vienna Service Office in the UNO City, Director General of UNOV, Yury Fedotov and the new Mayor Michael Ludwig confirmed the good and close cooperation between the City of Vienna and the local UN organisations.